On December 15, a new era in the ABB FIA Formula E Championship will begin in Ad Diriyah (Saudi Arabia). 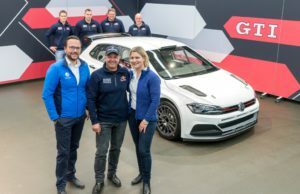 Thanks to the electric cars’ greater range, the drivers will compete with only one race car for the first time. Audi now unveils the newly developed Audi e-tron FE05, with which Daniel Abt and Lucas di Grassi will again make a bid for the titles. This represents the greatest Formula E innovation until now. For the first time since the launch of the series in 2014, drivers will only use one car per race to tackle the new 2018/2019 season. The batteries now have the capacity to last the entire 45-minute race distance. Thus mandatory car change during the race is not necessary. This is a testimony to how motorsport – especially Formula E – is advancing innovations and technology. This is particularly true of the key component at the heart of the Audi e-tron FE05: the drivetrain, which consists of the motor, inverter, gearbox, components of the rear suspension, as well as the corresponding software. While the rest of the car is identical for all teams, manufacturers get the opportunity to showcase their technical expertise with the drivetrain. 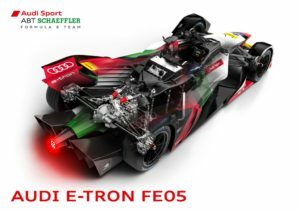 In the fourth season of the all-electric race series, which concluded with Audi Sport ABT Schaeffler winning the teams’ title in New York mid-July, the Audi e-tron FE04 very often proved to be the most efficient car. Its successor is an evolution of this winning model. Audi and its technology partner Schaeffler jointly developed the motor generator unit Audi Schaeffler MGU03. Engineers put particular emphasis on making the package even more efficient and further increasing its level of effectiveness. “We retained the basic concept with one gear and at the same time refined the details and manufactured all of the parts,” says Tristan Summerscale, Formula E Project Leader at Audi. 95 per cent of the drivetrain parts are new and the engineers were able to shave ten per cent off the weight. 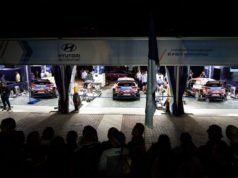 By the end of July 2018, the Fédération Internationale de l’Automobile (FIA) had homologated the car. There will be no more changes. Teams will only be able to improve the software during the season. The schedule includes a joint test with all of the competitors for mid-October in Valencia (Spain). Afterwards, the race cars and equipment will be transported to Saudi Arabia. For the fifth season of Formula E, the motor is permitted to produce up to 250 kW (340 hp) in qualifying. In the race, there will be a limit of the output – 200 kW (272 hp). New are the so-called activation zones: When drivers pass through this zone on the racetrack, they can briefly access a higher power mode of 225 kW (306 hp). Formula E fans can still support their favourite driver by casting their vote online via “FanBoost”, which gives drivers a temporary power boost of up to 250 kW (340 hp). All Formula E teams draw electricity from identical McLaren batteries weighing 374 kilograms. The lithium-ion battery is between the driver’s seat and the powertrain. It has a capacity of 52 kWh and charging happens within 45 minutes. A completely new development for the fifth season is the “Brake-by-Wire” system. Brake control and transmission to the rear axle are decoupled from each other and electronically controlled. The brake balance is therefore always optimally distributed and recuperation becomes even more efficient. CFRP crash structures at the front, rear and sides provide maximum safety. Also new – analog to Formula 1 – is the halo system above the cockpit which provides additional protection for the drivers’ heads. The minimum weight of a Formula E race car is 900 kilograms (including the driver). The electric race car accelerates from 0 to 100 km/h in 3.1 seconds. Top speed is around 240 km/h. Of particular note: the new generation of the Audi e-tron FE05 comes without a rear wing – a rarity in motorsport. Thirteen races in 12 major cities are planned for the fifth season of the electric race series. Between the opening round in Ad Diriyah and the double-header finale in New York in mid-July 2019, races will take place in Marrakesh (Morocco), Mexico City (Mexico), Hong Kong (China), Rome (Italy), Paris (France), Monaco and Berlin (Germany). Each race continues 45 minutes plus one lap. Most of the races are on temporary street circuits in city centres. This partnership is new for the fifth season, with a healthy competition between the two teams intended to continually increase the performance level. 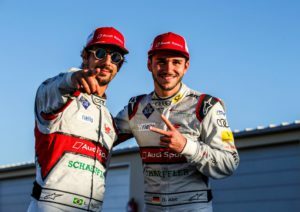 The Audi Sport ABT Schaeffler team is a founding member of Formula E. Daniel Abt and Lucas di Grassi are competing since the very first race. 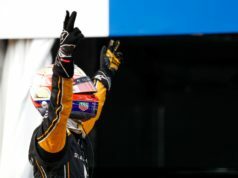 The Brazilian clinched the title in the drivers’ championship in the third season (2016/2017). The 2017/2018 season concluded with di Grassi as the runner-up and Abt in fifth place.